A lot of smartphones these days come with unwanted software and apps that simply hog your resources and don’t provide any value. They’re put there by the manufacturer and sometimes can’t even be uninstalled. In other parts of the globe, carriers take on the responsibility to inflict this misery on users. These apps or bloatware as they are called can be removed through a command line or shell but it is a tedious process for someone who changes devices regularly. Fortunately, the dedicated Android community always has some solution for everything. So we stumbled upon an app called Debloater on XDA that does all the hard work for you. Best part is it doesn’t require root if your device is running version KitKat or above. That covers a majority of devices these days. The Debloater app blocks not only third-party apps but system apps as well. And it is as easy as firing up debloater and checking few boxes. The app can disable as well as block apps completely on your phone. This does not mean the app will get uninstalled. The app is a PC software so you’ll have to connect your phone to the PC for the whole process. Note: Some apps in the Debloater app are system core apps. Hence, you should be cautious when disabling or blocking an app. If for some reason, you blocked/disabled a system app, it could lead to boot loop. 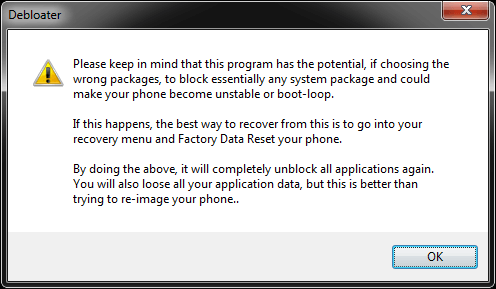 To recover from that, simply boot the phone in recovery mode and reset it. This will clean all data but get your phone working. Android Kitkat and above. If you’re running Android version below Kitkat, you need to root your Android device. Step 3. Connect your phone to the PC and fire up the Debloater app. The app will automatically detect your device compatibility and scan the phone for all APKs. The application is fairly easy to use. Once it detects your device and compatibility, it will move on to the main screen. All the options are pretty simple and self-explanatory. It will look like this. In order to confirm everything is working fine, just check your device’s Serial Number and Model mention at the bottom right corner. If you’re running Android Kitkat and above and you have not rooted, it would show red dot in front of root i.e Not rooted. You have to click on the “Read Device Packages button” on the top left corner. From there on, you simply select apps you want to block on the list. As you select new apps, a “Synced” option at the bottom will turn Red. This is to indicate that you have made some changes from that vary from the past boot. There is a counter that shows blocked and unblocked apps in the top right corner. Debloater will also indicate to you what it detects as applications that are already disabled/blocked on your device by putting a checkmark in the box next to the application. Along with all this, it also shows Total no. of App packages on your device, No. of changes you have made in this session. Simply select apps that you want to block. As you tick mark those apps the “Read Device Package” button will turn to “Apply”. Click it after you have selected the desired apps and they should be blocked. After pressing the Apply button, all the changes made to the application listing in Debloater, will be applied to your device. Please make sure you don’t check any System Apps like Phone, contacts while scrolling through the list. Before clicking on Apply, check the App listing thoroughly to find any apps marked by mistakely. Debloater also has a filtering option that allows you to search for particular keywords in case you have a long list of apps. After applying any changes, you would see Processing text in the App listing window. Don’t click on any options during the applying process. Additionally, you can deselect all apps by hitting the “Unblock all Packages” button if you want to sell your device. Debloater also has an import-export function for your customised block lists. This can be handy if you change your phone and don’t want to go through the blocking procedure all over again. You can right click on the Read Device Packages button and export the blocked packages to a file and share it. If you want to import it to other device you need to perform the same procedure, but this time right click on the Read Device Packages and choose import blocked packages and then click the Apply button. While Debloater was made for Android Kitkat and above devices, this software doesn’t work with Android Oreo. In Android Marshmallow and above versions, Debloater doesn’t block the apps but just disables them. While some might find it useless, it can help you disable multiple bloatwares in few clicks. 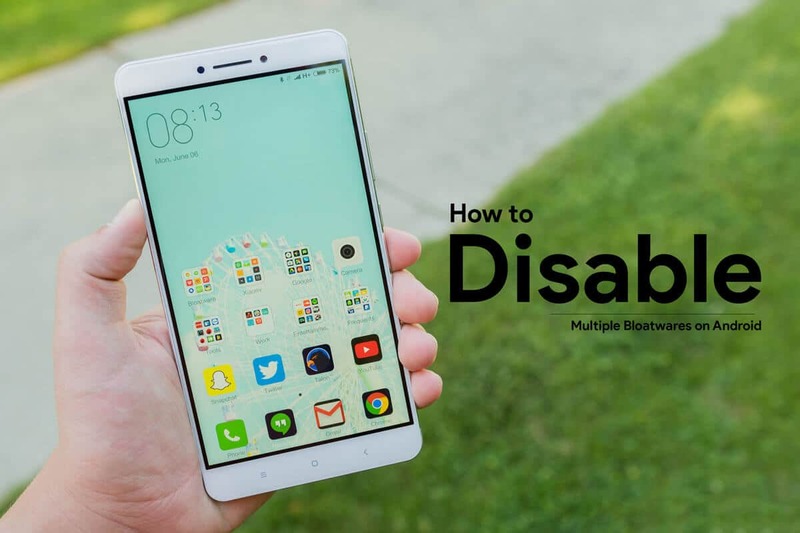 If you really want to disable Android Apps in Android Marshmallow, Nougat and Oreo devices, you can refer our Bloatware removal guide without rooting. Samsung bashes a decade of Apple products with their latest anti-iPhone Ad "Growing Up"